The Turret is a unique apartment with stylish contemporary interiors in a converted shoreside Victorian mansion on the outskirts of Oban, and enjoys panoramic views of Oban Harbour and the Sound of Kerrara. The generous open-plan living space includes a corner turret, as well as comfortable sitting and dining areas. Oak flooring makes this a light, airy space, reflecting the shimmer of the sea, and beautifully furnished in soft greys and whites with splashes of colour. It’s the perfect haven for relaxing days, watching the yachts and ferries sail by, and cosy evenings in front of the log burning stove. The well-equipped kitchen contains all you might need to make best use of the fabulous local produce on offer. The luxurious bedrooms are both decorated in calming greys with crisp white linen, and the en-suite master bedroom features an indulgent window seat in the bay window, somewhere to curl up with your favourite book. The bathrooms are decorated to a high standard with walk-in showers. 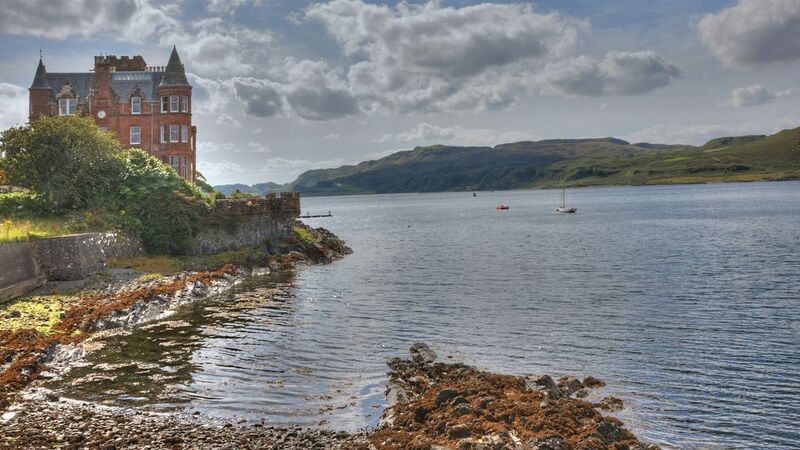 Conveniently located on the outskirts of Oban on the west coast of Scotland, The Turret is a short drive (or half hour walk) from Oban town centre, where you will find the bustling harbour and several award-winning restaurants. There is outstanding scenery and many outdoor activities within easy reach. Whether you want to explore the Highlands and islands or just chill out, the Turret provides a comfortable base to relax and unwind and offers a perfect year-round escape.